When Felix hurt his legs while living on the streets of India, he ended up stuck in a sewage gutter, in so much pain that he couldn’t move. All he could do was cry — as loudly as he possibly could. He was desperately trying to find someone to come and help him, and, thankfully, the right people heard his cries. Animal Aid Unlimited found out about Felix and immediately rushed out to help. As rescuers approached the spot where he was, they could already hear his pained cries, and they knew that something must be terribly wrong with the poor pup for him to be crying so much. … so they threw a blanket over him and scooped him up, eager to get him back to their hospital to figure out exactly why he was so upset. 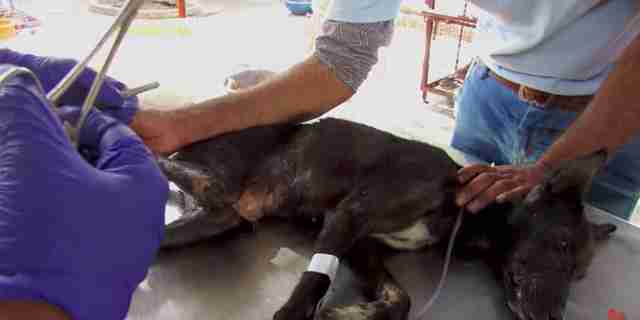 Once Felix was safely back at the Animal Aid hospital, they sedated him and set about treating his injured legs. They sutured him up and then gave him lots of time to rest, knowing that when he woke up, he would feel so much better, and be so much happier. “He learned to trust, and healed in just two weeks," Animal Aid Unlimited wrote in a video about Felix. … and lets them know it every single day. Felix is now the biggest lovebug, and just wants to cuddle and be loved on all day long. He’s so happy to no longer be in pain, and is finally loving life again, exactly the way a puppy is supposed to. To help other animals in need like Felix, you can donate to Animal Aid Unlimited.